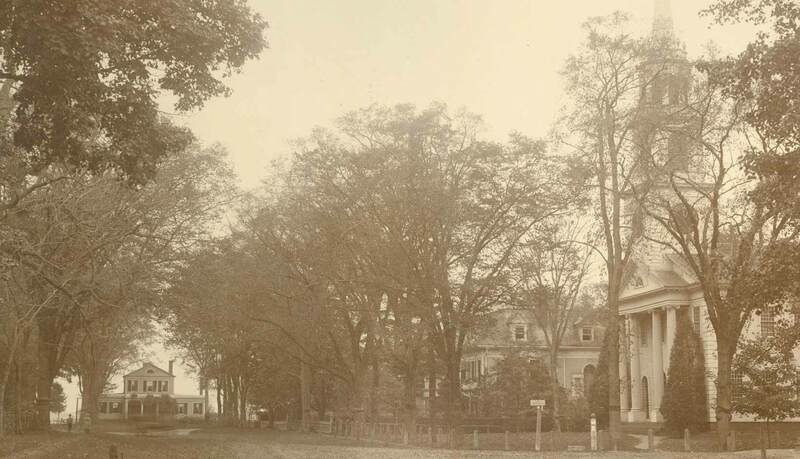 The Fox Chase contains two key landmarks of the village of Old Lyme. The Griswold House at the north end of the town and the Congregational Church nearer the south. Beyond the church the town grows less dense before giving way to the marshes along the banks of the winding rivers or sandy shore along Long Island Sound. The two are linked by “The Street” which is now referred to as Lyme Street. The village of Old Lyme is not much more than one long street with a few smaller side streets. “But such a street!” one observer exclaimed in 1915. Originally the main street was overhung with a double row of elms and sycamores that offered a gothic-arched canopy to those who drove or walked the street. 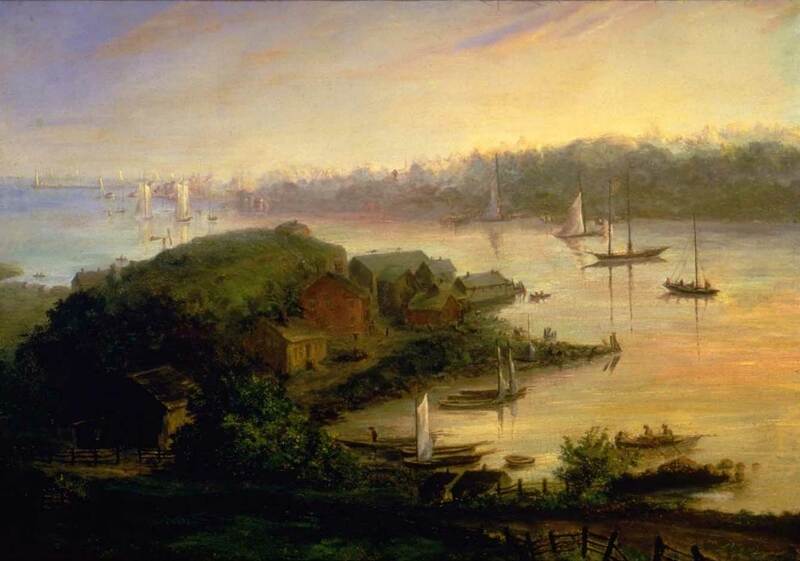 During the years between the American Revolution and the 1820s, shipbuilding and commerce brought a great deal of wealth to the town. Young men came to town and found work in the many shipyards, mills, lumberyards, and warehouses along the river. 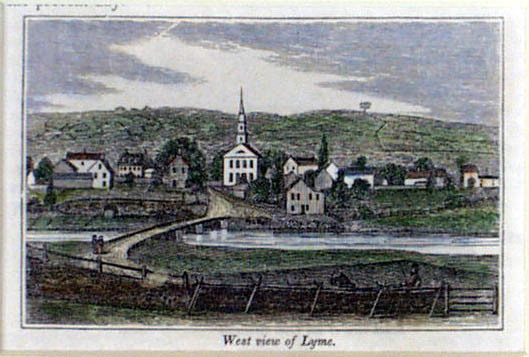 In 1810, Lyme was more populated than the city of New London—primarily with young single men over the age of 25. With the boom, sea captains and business owners built beautiful homes along the main street of the town. However, changes in the shipping industry as the technology turned from wind-power to steam, as well as the impact of the Civil War, diminished the need for such a workforce, and by the end of the century the population had gone down by more than half. 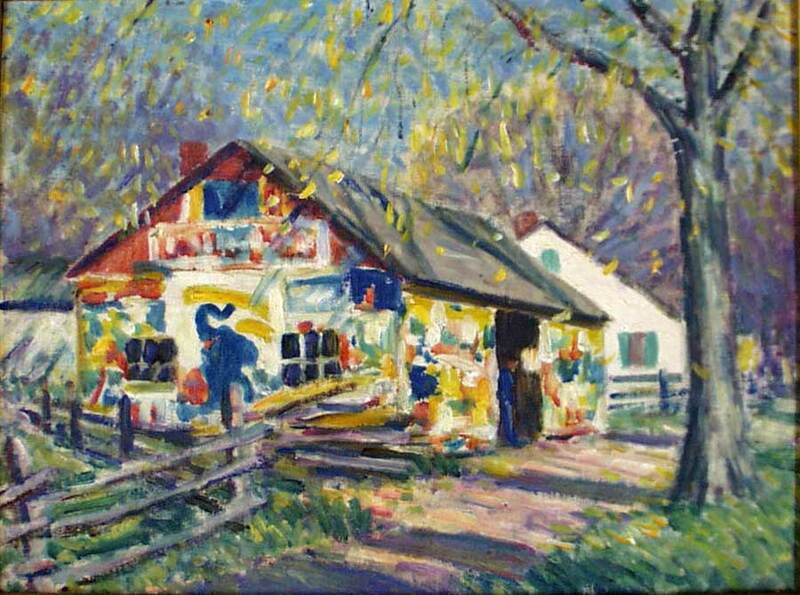 The town became quiet and many of the surrounding farmhouses were left to fall into a state of disrepair and decline. When Miss Florence opened her home as a boardinghouse for artists, its faded glory was part of the appeal. 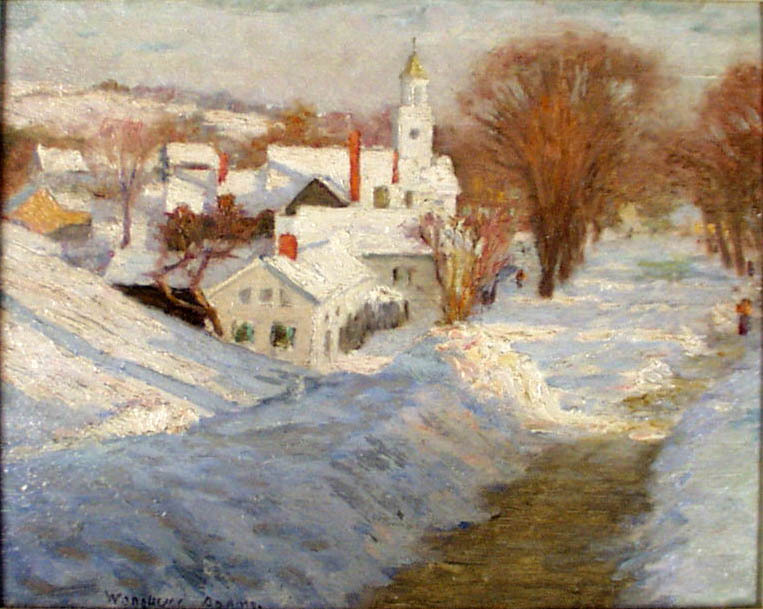 Arthur Heming writes, “Against the mildewy and tattered wallpaper of forty years old design, hung by heavy cords and tassels, were a number of ancestral portraits—for her relations included Governors of States and Chief Justices of the Supreme Court—and minutely painted pictures of clipper ships that had sailed the wintry seas between Lyme and London, England before the days of steam.” Indeed, many of the artists left New York in search of just such a place steeped in history. Perhaps the most peaceful, lovely old town in the Connecticut valley, is Old Lyme. It is the only river town in the State that has remained a purely residential one, but its colonial houses hold within their walls many memories of the days when the building and sailing of ships was the chief occupation of their owners. 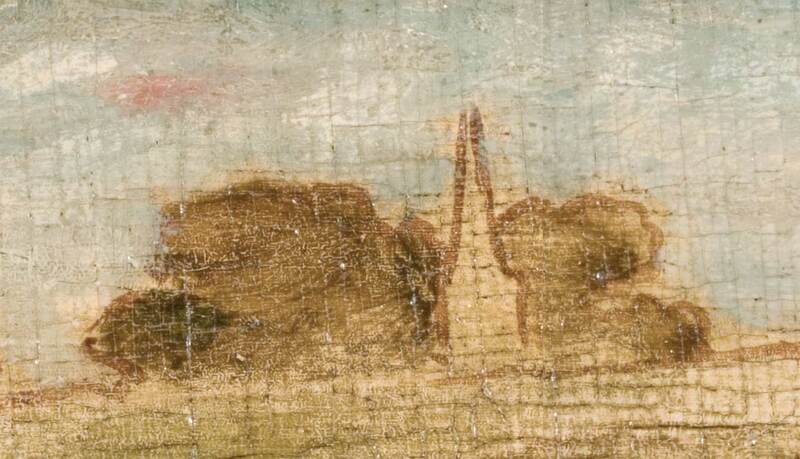 Had this village not been picturesque as well as patrician it might never have been attacked by the artist. 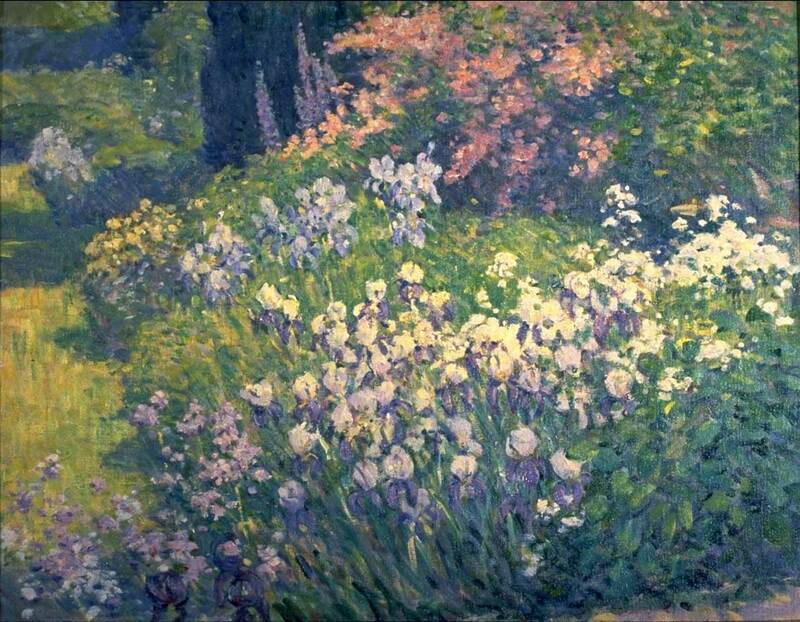 But it had the sort of landscape ‘bit’ to appeal to a painter, who is every a lazy sort of animal, and does not like to take long walks to his work; if he can get it in his back yard or from his studio window, so much the better. The Street’ springs upon you like a new character in a novel. There is no warning of its nearness until you are among its soft shadows. It has a fascinating air of easy old-fashioned elegance, is a mile and a half long, is wide enough to swallow a whole family of New York city streets, is lined with handsome grandfatherly-looking trees, and mansions, some modest, some pretentious, some antique, planted on either side of it at neighborly distances. . . . The scene is one of tranquility on a broad scale. Wednesday and Saturday afternoon are especially gay at the Lyme exhibition. The broad village street is lined with automobiles and the lawns about the gallery dotted with attractive tea tables, gray, surrounded with blue, rush-bottomed chairs, and adorned with dainty linen and china and bowls of beautiful flowers. The wives of the artists and other ladies of Lyme serve tea and punch, cake and sandwiches to the visitors, the proceeds being devoted to the Lyme Public library which for 20 years housed the exhibition. After the 1876 Centennial Exposition in Philadelphia, which celebrated the founding of this country, Americans, and particularly New Englanders, became captivated with the nation’s Colonial legacy. The late 19th century was a time of dramatic urban and industrial development, with new populations flooding New York from Europe. Noise and air pollution became commonplace. The health of city dwellers and the welfare of working children became national issues. Americans began to look to the nation’s past to find comfort from the anxieties of a rapidly changing world. The Colonial Revival movement, with it roots in the traditions of New England, impacted architecture as well as fine and decorative arts of this era. 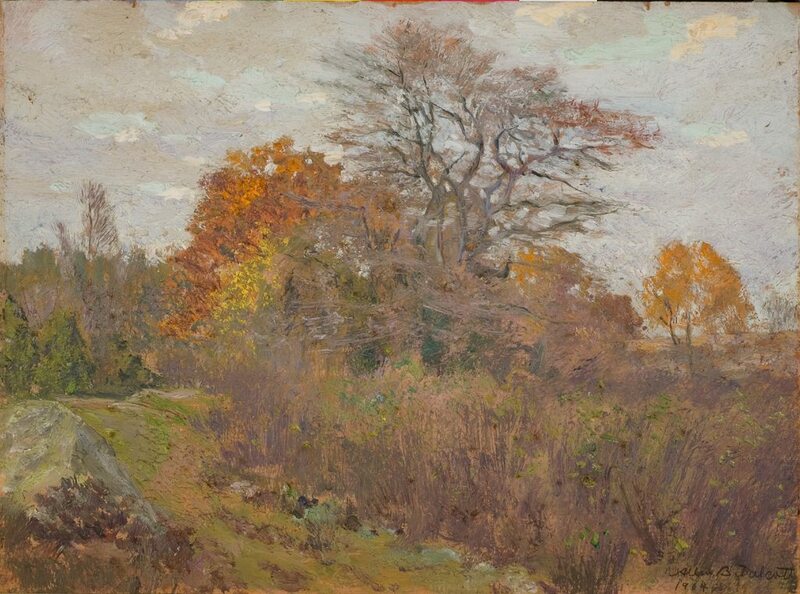 The artists were drawn to Old Lyme, which seemed directly connected to the nation’s past, because of its historic and rural character. 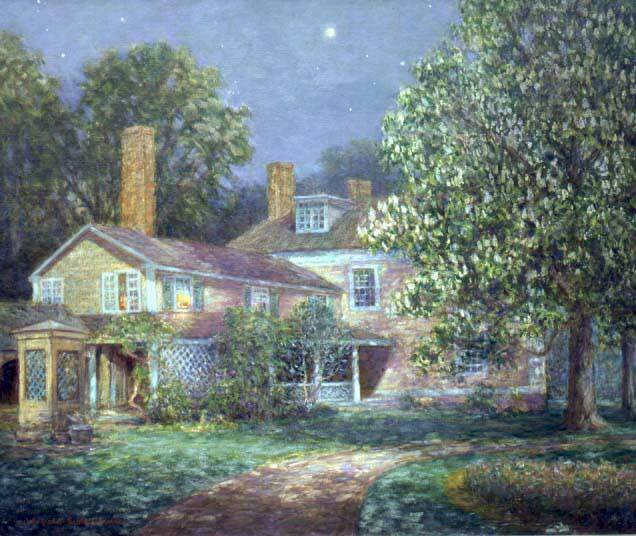 Once there they made paintings of New England icons, such as the Colonial-era homes along Lyme Street, including Miss Florence’s boardinghouse. 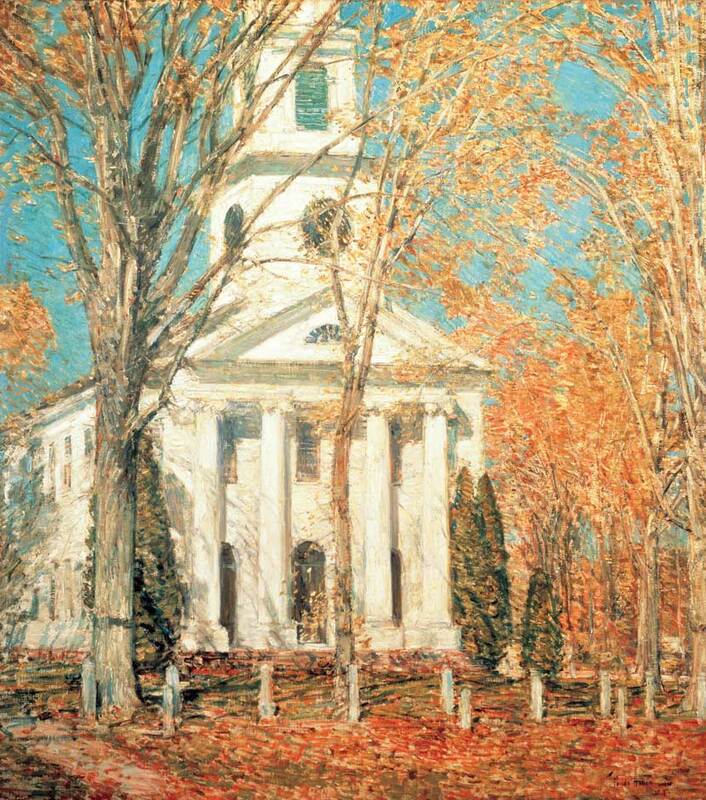 They also painted the Congregational Church, the charming Bow Bridge, the rustic mills, old-fashioned gardens and ancient trees, often during the colorful New England fall. The annual summer exhibitions in Old Lyme were filled with local scenes that appealed to collectors, who found solace in these images as nostalgic emblems of a simpler time. 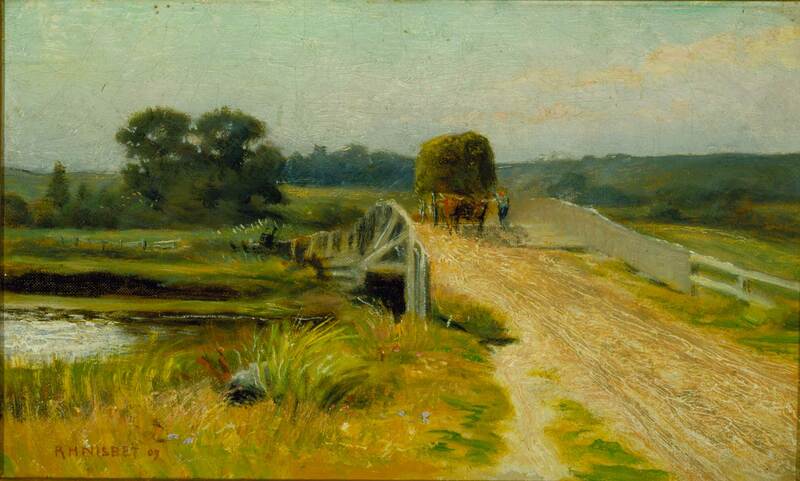 Reviews of the exhibitions appeared in New York and Boston papers, enticing waves of tourists to drive to Old Lyme. 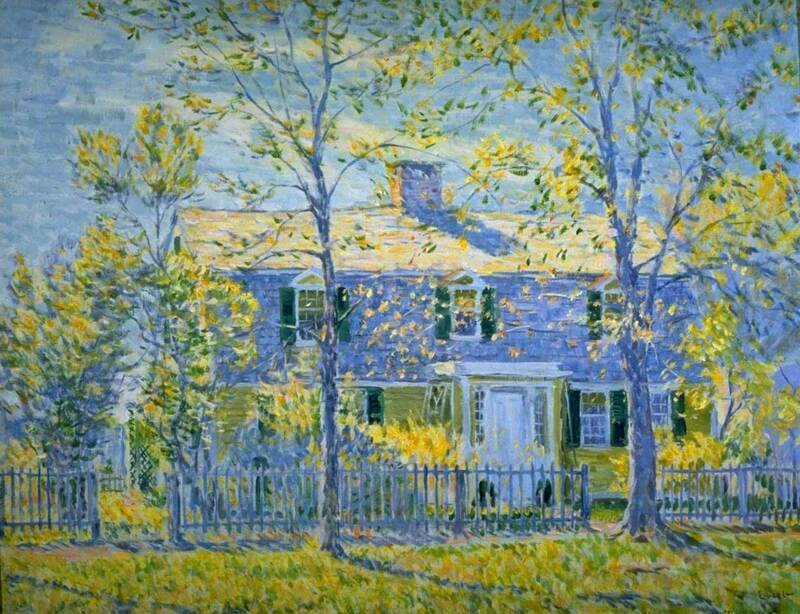 They would enjoy the local hospitality of a tea on the lawn of the Art Association and would stop in to view the painted panels in the Griswold House next door. 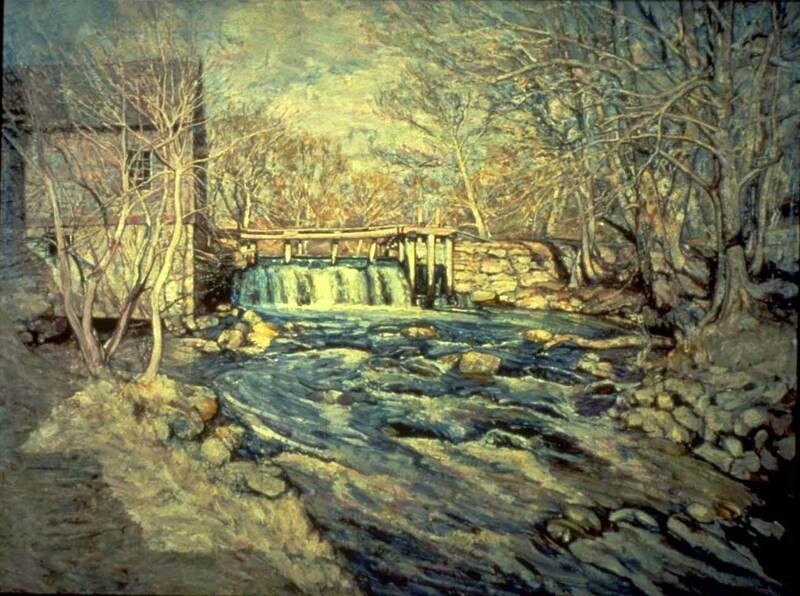 In the end, Miss Florence summed up the town’s transformation when she said, “So you see, at first the artists adopted Lyme, then Lyme adopted the artists, and now, today, Lyme and art are synonymous.” Today, in addition to the Florence Griswold Museum, the town is home to several esteemed art institutions such as the Lyme Art Association and the Lyme Academy College of Fine Arts. 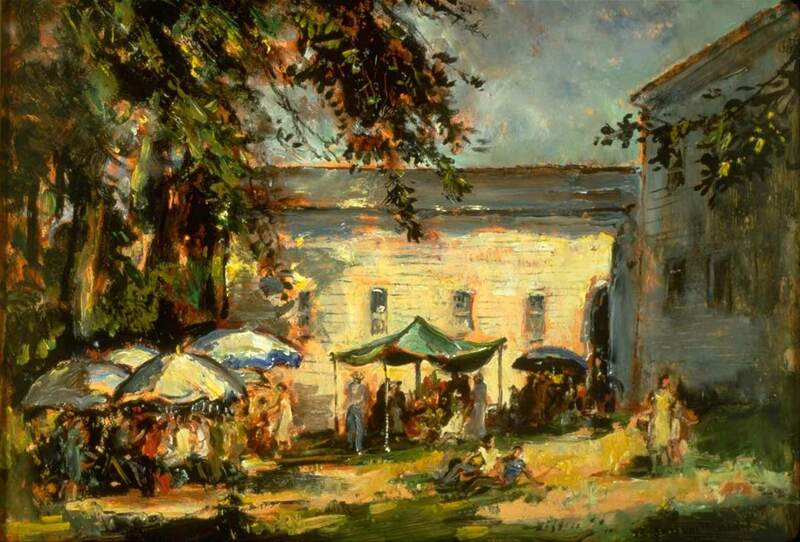 Rudolf Scheffler (1884-1973) Bazaar at Old Lyme, 1950 Oil on panel Gift of Mr. Peter Hastings Falk and Shannon Fine Arts, Inc.
Childe Hassam (1859-1935) Church at Old Lyme, 1905 Oil on canvas Albright-Knox Art Gallery, Buffalo, New York Albert H. Tracy Fund, 1909.